Jay Wexler is Professor of Law at Boston University. He is the author of Holy Hullabaloos: A Road Trip to the Battlegrounds of the Church/State Wars and The Odd Clauses: Understanding the Constitution through Ten of Its Most Curious Provisions. The Supreme Court has a lovely tradition whereby each Justice’s group of law clerks gets to go out to lunch with each other Justice once during the term. This tradition, which dates back to the sixteenth century, allows the Court’s thirty-six or so law clerks to have at least a little face time with all the Justices. When I was clerking for Justice Ginsburg during the 1998-1999 term, for example, my three co-clerks and I were lucky enough to share Indian food with Justice Breyer, pizza and red wine with Justice Scalia, and classic American with Justice Stevens. The only Justice we didn’t have lunch with was Justice Kennedy, and that was only because on the day of the event, we were notified that we would have to get dressed up to be seen with the Justice in public. Since we generally showed up to work in bathrobes and hair curlers, we were forced to decline the invitation. When people ask me which Justice seemed the most like a regular, normal person, they often appear surprised when I say that it was, without any doubt, Justice Thomas. Not that “Most Normal Supreme Court Justice” is a particularly difficult title to achieve, but during our lunch, Justice Thomas impressed me as being a totally friendly and incredibly down-to-earth guy, and I say this not just because he laughed at my “Why- did- the- guy- get- fired- from- the- orange- juice- factory?- Because- he- couldn’t- concentrate” joke. Obviously my time up close with Justice Thomas was extremely limited, but I did get the sense that he cared a great deal about the people who he worked with at the Court. He’s the guy, for example, who supposedly knows the name of everyone who works at the Court, from the cafeteria workers to the Curator’s assistant to the security guards. At the time of our lunch, one of my co-clerks was having a family problem that Justice Thomas knew something about. The next day, I was working on some memo or something when the door to the chambers opened. It was Justice Thomas with a book that he wanted my co-clerk to have. It’s hard to communicate how unusual it is for a Justice to just pop into the chambers of another Justice, much less anywhere near where the clerks sit. Perhaps it’s some evidence of how startling it was that, when I saw Justice Thomas suddenly standing in front of my desk, I immediately projectile vomited all over my memorandum. It has been widely reported recently that Justice Thomas has not asked a question from the bench in over two years. This fact is about as interesting as one of my hangnails, and somewhat less important. Many in the blogosphere and elsewhere have taken Justice Thomas’s silence as a sign that he is not engaged or is not fully doing his job. For some it’s evidence to support their already existing views that Justice Thomas is a bad judge or a bad person. These criticisms are unfair. Oral argument may play an important role in the lower courts, where it can help judges figure out what’s going on in a case with messy facts, but in the Supreme Court, where cases are only heard if they clearly present a discrete legal issue, oral argument simply isn’t a big deal. More than anything, the Justices use the time to argue with each other, albeit indirectly, through questions posed to the lawyers. This will probably come as a huge surprise to many readers out there, but some lawyers, even judges, like to talk just to hear themselves talk. Justice Thomas has indicated that he sees no reason to talk for this purpose, and I have to say I kind of admire him for it. Please don’t get me wrong. I wish Clarence Thomas was not on the Supreme Court. Justice Thomas’s jurisprudence threatens to send the nation back to the middle ages. In my own field of study, church-state law, Justice Thomas has said that the First Amendment’s “Establishment Clause” does not apply to state and local governments. This means that states and localities would be free to promote religion by, for instance, putting up huge crosses on public property, teaching creationism, and leading school prayers. Probably they could even set up their own official religions. Just thinking about this makes me want to cry. In other areas of law, from the Fourth Amendment’s prohibition on unreasonable searches to the Eighth Amendment’s ban on cruel and unusual punishment to the breadth of executive power, Justice Thomas’s crabbed approach to constitutional interpretation has similarly resulted in the abuse of individual rights. This is plenty reason enough to lament Justice Thomas’s presence on the bench (and, sweet mother of God, to vote Democrat in November), without resorting to criticisms about his silence there. Indeed, given Justice Thomas’s reactionary views, liberals should probably be happy that he doesn’t speak during oral argument. If only somehow he could be persuaded to write as few opinions as he asks questions, now that would be something worth talking about. 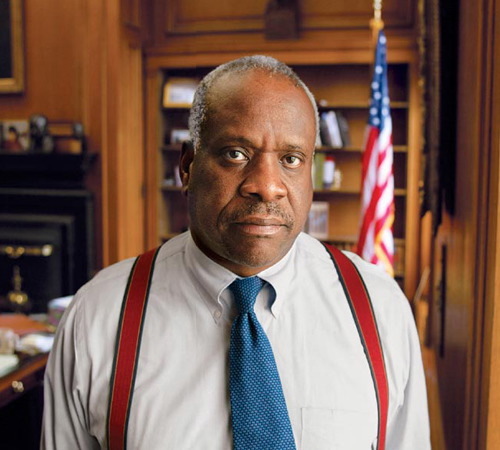 Quote of the Day: Justice Thomas Speaks!